← DEN 405 takes control at the Europeans…. Frederico Melo, Gustavo Lima and Jose’ Matoso. European Champions.. So my friends it came to the last day of this exciting Championship to decide the winner’s. With a light wind forecast many thought it unlikely there would be a race at all. However, a good breeze from the East set in and a start got underway around 12.30 yesterday. The problem with an easterly wind, when the sun is out and temperatures are soaring, is that it dies away. This is because the thermal more traditional trade wind from the North-West tries to arrive and fights against the easterly. So I personally was not surprised when the first attempt to complete the final race had to be abandoned again due to no one reaching mark 1 within the prescribed 45 minute’s. So the fleet re-gathered, some getting towed in thinking it was all over… But, with a 15.00 hrs cut off time, the PRO was determined to try for another start and his patience was rewarded when a steady breeze did indeed fill in from the West, a 180 degree change to the original morning wind. With some competitor’s complaining about the time limit, a Black Flag start got away just in time, on a line that gave a bias at the PIN end and a short 1.1 mile beat. GBR 720 Graham Bailey crewed by his wife Julia, young Will Heritage and Richard Powell, got a super start from near to the PIN and were able to tack onto Port to make a significant jump on the fleet. Below him UKR 7 Marcus Wieser was also quick off the line and these two boats pulled out from under USA 310 Ted Sawyer who had “nailed” the PIN and rolled back the years (all 80 of them) as he crossed nearly the entire fleet on port. With most of the fleet all fighting hard for their overall positions it was not clear who would take the European Title as all of the pre-race favourites were no where to be seen. As the wind gained in strength the second beat was lengthened to around 2 miles giving chance for the “speedy” sailors an opportunity to make gains. One thing for sure it did do was to give Graham and his superb “Corinthian” team, a chance to stretch their lead and they ran out easy winner’s. This moved GBR 720 “Aimee” and the Baileys up to 6th place overall and of course easily took the Corinthian Prize. Well done! Meanwhile, back in the serious fight for overall glory, it was all hands to the pump with team’s in contention fighting for their lives on the final 2 mile down wind leg. As it turned out it was POR 55 Jose Matoso who finished in 19th place, to give him overall victory by 6 points from UKR 7 Marcus Wieser (the holder and 3 times European winner in last 4 years!) who finished runner up thanks to his 2nd place on the day. 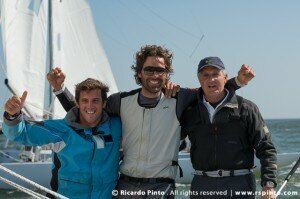 In 3rd place yesterday was GER 1078 helmed by Tim Ladehof who sailed very fast all week. If not for his two Black Flag’s early on in the championship, Tim and his team would have been worthy contenders. So there we have it, Portugal’s first European Champion for 56 years, congratulations to Jose and his team. 2nd overall was UKR 7 Marcus Weiser and 3rd DEN 405 Jens Christensen. Following the Baileys in the Corinthian section in 2nd place was GBR 766 Robert Campbell, crewed by Leigh Behrens and Nick Carus who sailed a great regatta (16th overall), the 3rd Corinthian was SUI 307 Uli Libor, crewed by his son Janos and Michael Handrick (21st overall).